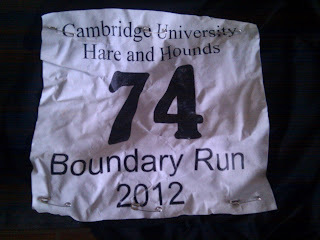 Today saw the Cambridge Boundary Run, organised by Cambridge University Hare and Hounds. 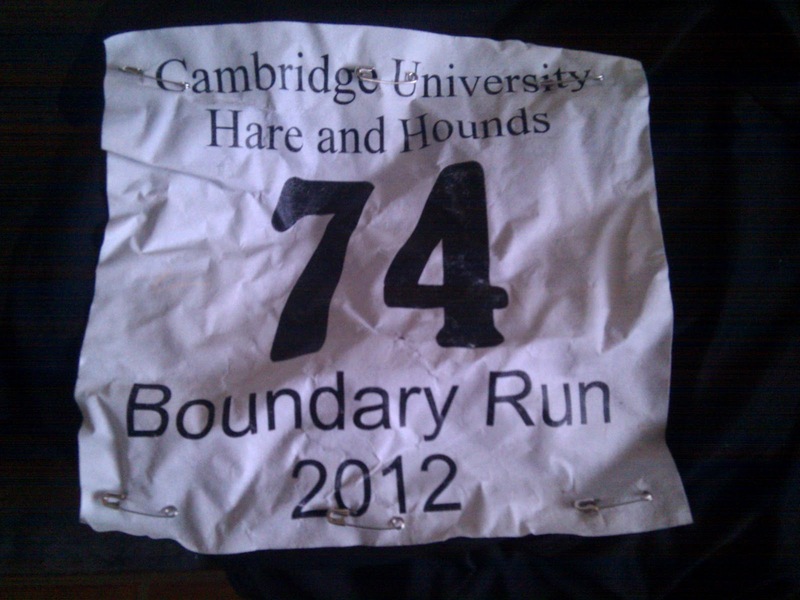 This was a circular marathon around the outskirts of Cambridge, with an option to run a half marathon on the same course. I wasn't expecting to run a fast time. While the course is largely flat, with most of the "hills" simply being the ramp up and down a bridge, it had a variety of terrain, from pavement to muddy footpaths, with plenty of standing water and plenty of rain. There were also enough road crossings to slow me down a little. We set off from Coldhams Lane business park, on the Eastern side of Cambridge, next to the airport. I knew I needed to get away quickly because the route follows a cycle path which becomes a narrow alleyway in the first mile and I didn't want to get stuck in an early bottleneck. Despite the quick pace I felt good and thought I'd keep going and see how things progressed, only to get stuck at a level crossing for a couple of minutes in the second mile! After we got going again, I saw a bunch of runners heading back towards me, having missed the right turn I was about to take. The route was well marked, with large flour arrows on the ground and many small arrows on lamp posts. We were given an A5 map as backup but I only really needed it once or twice towards the end. Miles 3-5 were a long drag up a road (ah, so there was a hill, I remember now), before grabbing some water and heading off road for a lovely section winding through the woods near Addenbrookes Hospital. The next couple of miles were a bit dull (the rain wasn't helping with the view!) before reaching the second water station for another swig and an orange segment. This led onto a nice riverside path before wiggling round some univeristy sports pitches and then more cross country to run over the M11 and into halfway, which I reached in 1h53. It was busy here as many of the runners were finishing their half marathon here and the field thinned out noticeably. After a bit more road, mile 15 was a long, muddy footpath, passing back under the M11. I was still feeling good at this point, so just kept the pace ticking along at about 5m18s per kilometre (according to my GPS watch). Mile 17 took me through some quiet, residential roads, before more fields and another very welcome water station. This led onto a dull main road, but the marathon route soon turned off and under the A14 for a long, wet and muddy stretch. The rain had picked up by this point and my lightweight rain jacket was struggling as much as I was. I had kept running at a steady pace and although I was beginning to slow down a little, I knew I was on for sub 4 hours now if I just kept moving. This knowledge spurred me on and, after a footbridge over the A10 which felt like just a bit too much hard work, I was back onto quiet, wet roads. I'd been running on my own since halfway and was quite relaxed, but stressed a bit to see another level crossing ahead! Would I make this one or not? I accelerated as best I could and was so glad I had, because the siren started just as I stepped off the rails! Now I was onto a canal with a few steps to climb over the bridge and soon reached the final water station. 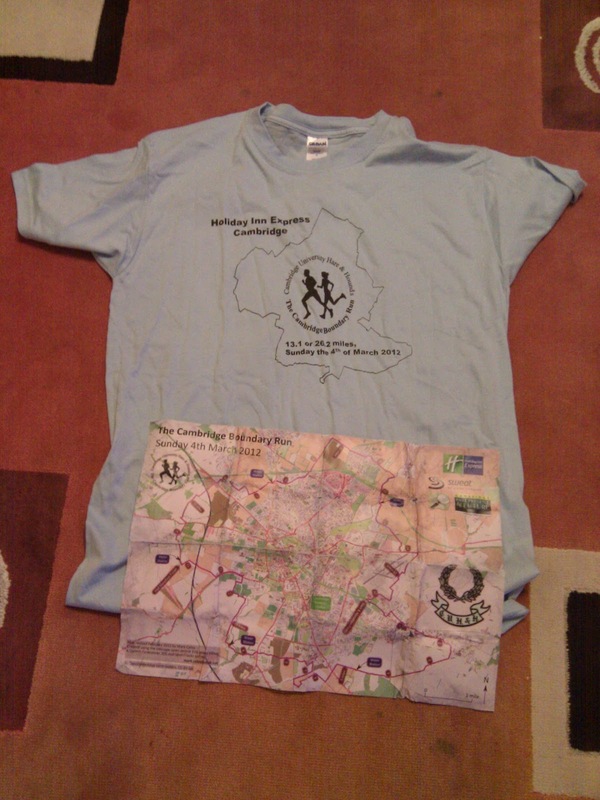 I didn't drink much on the run - just a half cup of water or isotonic drink every 4.5 miles or so, but surprisingly I didn't feel particularly thirsty, not that it was very warm. The cold and rain was taking its toll on me now. I knew a 3:50 PB wasn't on, but I was going to be comfortably inside 4 hours, although a slippery path across a field of crops had me worried that it would slow me down too much. This was soon over and I hit the main road around Cambridge airport. There wasn't much to see and I was in no state to look at the view anyway. It was raining hard, my legs were really wobbly but I was still passing people. Two guys and then a group of four flew past on the last mile, but I just kept running, and suddenly I was on Coldhams Lane again, managing to cross without waiting for the traffic, for the last couple of hundred metres into the finish in 3:53:50, very pleased with my time but wondering what could have happened if that barrier hadn't been down. This was a great way to finish my 34th marathon. Despite a couple of problems at the start with the parking (it was unclear where to park and the gym and shop staff were telling runners to park somewhere else) and toilet queues this was an excellent race. Well organised, well marked, a good route and one I'd definitely run again. Thank you to all the volunteers at the water stations and on the route. It wasn't a great day for them to be standing in the rain!